The northern most serious wine region in the world, the Okanagan Valley runs for 125 miles along a chain of lakes that stretches from Armstrong, British Columbia, south to the Washington border. The region is often extended a few miles north to include the wineries around Salmon Arm. The wines of the Okanagan are known around the world. At the northern end grape quality is ultimately enhanced by the vines' struggle to give forth ripe fruit in a shorter growing season. Wines produced here are often referred to as Cool Climate Wines. They include Ortega,Gewürztraminer,Pinot Gris, Gamay Noir,Kerner,Syrah, Maréchal Foch and Viognier. Kelowna is the largest city in the Okanagan . If your coming from the south you have to cross the lake on a floating bridge to reach the city. With more than 2,200 hours of sunshine per year numerous wineries make there home here. They include Calona Wines, Bounty Cellars, CedarCreek Estates, House of Rose, St Hubertus, Summerhill Pyramid Winery and Tantalus. The Westbank, the slopes of Mount Boucherie, now known as West Kelowna features Mission Hill, Beaumont Family Estate, Little Straw Vineyards, Rollingdale, Mt. Boucherie Estate and the Organic vineyards of Kalala Winery . 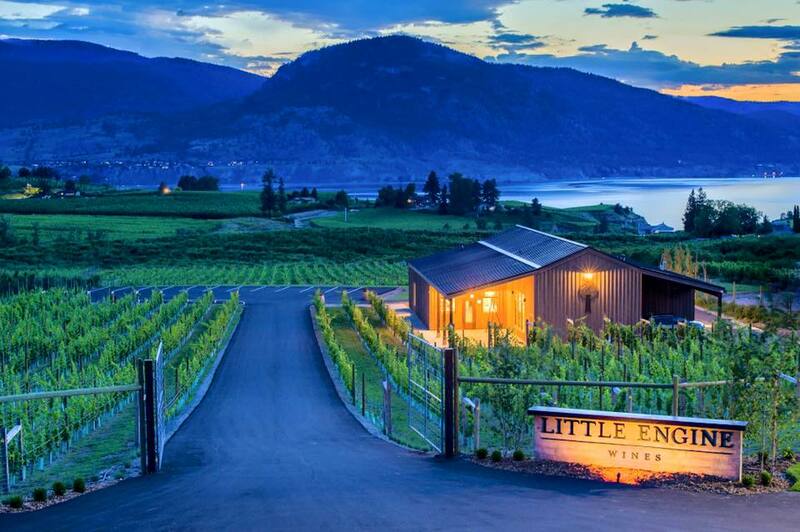 Just a short distance away are the wineries of Peachland and Summerland. Sumac Ridge and Hainle are wineries with a proud history. Here we also find Adora Estate Winery, Hijas Bonitas Vineyard and Silkscarf. Meyer family Vineyard and Van Westen with their renowned signature wines Vino Grigio, Vavacious and Volptuous. Larger wineries with good reputations include, Red Rooster, Hillside, D'Angelo Estate Winery ( also in Ontario) Kettle Valley and Lake Breeze. The king of Naramata fruit wines is Elephant Island. LA Frenz winery makes some outstanding fortified wines. The South Okanagan would include Okanagan Falls, Oliver, and Osoyoos and Oliver the Wine Capital of Canada. Numerous lakes help the micro climate of the Valley. The major lakes are from North to South are the Shuswap Lake, Okanagan Lake, Skaha Lake, Vaseux Lake and Osoyoos Lake. Okanagan Lake, home of the legendary lake monster Ogopogo, is the largest lake in the region and its sandy beaches attract numerous summer vacationers. Penticton, Naramata, Summerland, Peachland, and Kelowna are all located on the shores of Okanagan Lake. The city of Penticton sits between Okanagan Lake and Skaha Lake. It has some beautiful beaches. Vaseux Lake ( 3 KM long)is more for the sportsman. The lake provides promising fishing opportunities for large mouth bass, rainbow trout and carp. In winter there are great opportunities for skating, ice-fishing, and ice-boating. As you drive through the Vaseux Lake, look towards the southwest and you will notice some cliffs that rise straight up for 250 metres (820 feet). This area is called the McIntyre Bluffs. in the Okanagan. Gamy, Kerner ,Optima Vidal Muller-Thurgau, Zweigelt and Viognier are all all grown producing fantastic wines. Merlot is the number one grape grown in the Okanagan. The various climates and soils conditions through out producing different tasting wines.